Rick Riordan, author of Percy Jackson and the Lightning Thief, Live webcast through GLOW. Join author Rick Riordan – creator of Percy Jackson and the Lightning Thief – as he brings the gods of Ancient Greece and Egypt explosively to life. 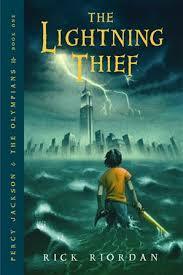 The Lightning Thief is a 2005 fantasy adventure novel based on Greek mythology. I have not read it nor seen the film but have gathered that the main character is a learner with dyslexia. The author Rick Riordan is an English teacher whose son has dyslexic difficulties. Get your Glow log-ins ready because on Friday 22nd January, Scottish Poet Elspeth Murray will take part in her second live Glow Meet with budding young Poets across Scotland. The event is on at 10am, Fri 22 January and is aimed at S2 pupils and suitable for teachers interested in getting some help and ideas with teaching poetry from a poet in real time. Teachers can take part even if they don’t have a class at this time. LTS is delighted to announce that the author of the fascinating and bestselling series ‘Chronicles of Ancient Darkness’ will be appearing live over Glow Meet from the Edinburgh International Book Festival. Michelle Paver will be speaking at 12:00 on Monday the 31st of August, so if you and your class would like to hear her talk about her exciting series of novels, set in the stone-age, and to hear about what inspires her to write, sign up by going to the Edinburgh International Book Festival Glow Group.